Brother Angelo “Twin/Tony” Riddick, Past Basileus Lambda Gamma Gamma Chapter, was confirmed by the 31st Legislature of the United States Virgin Islands as the Director of the Bureau of Information Technology and Chief Information Officer for the USVI in December, 2016. His recent appointment culminates 16 years of experience in the Information Technology field for the United States Army, Department of Defense and civilian industry. Colonel (retired) Riddick served 32 years with the United State Army and retired in 2014. He is a certified Project Management Professional and worked several project plans and implementations for both civilian and US government organizations around the world. He is particularly skilled with IT Project Management and voluntarily consults for several non-profit organizational websites. Originally, from Norfolk, Virginia Tony entered the United States Army after commissioning at Marion Military Institute in Marion, Alabama in 1981. He served for 2.5 five years in the US Army National Guard and Army Reserves before entering active duty in 1984. Upon entry, he served with the Infantry and then transferred to the Army’s Transportation Branch and finished his career as the Director for the Capability Development Integration Directorate (CDID) a senior office in the Army Cyber Command based in Ft. Belvoir, Virginia. He is a graduate of all requisite US Army military schooling including the Command & General Staff College and was selected to participate in the Army’s War College in 2005. Tony is also an Airborne Ranger and has completed many other military training schools in the area of logistics, transportation, infantry and information systems including the coveted Systems Automation course and the Advanced Management Program. He received the Chief Information Officers (CIO) Certificate and taught in the CIO certification program at the National Defense University from 2005 to 2011 concentrating in Global Enterprise Networking and IT Leadership and Cybersecurity. 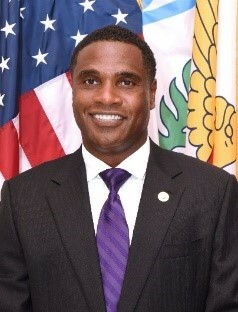 COL (r) Riddick holds an Associate of Arts degree in Business from Marion Military Institute, a Bachelor of Business Administration degree with a minor in Management from Albany State University and a Masters of Quality Systems Management with the National Graduate School of Falmouth, Massachusetts. COL(r) Riddick has also completed all course work for his doctorate degree with the exception of his dissertation (ABD).He is also a member of several professional organizations including the Project Management Institute and other social organizations. He has commanded at many levels in the United States Army to include transportation commands in Europe and Site Lead (Base Commander) for Forward Operating Base Warrior in Kirkuk, Iraq as a colonel in 2012. Tony worked as a business development director for a small IT firm in Indiana after leaving the military. Tony is married to the former Brenda J. Walker, also a retired military officer. He has one son Gary who is also a member of the Omega Psi Phi Fraternity Inc., as well.